Altantuya was shot twice in the head and blown up with C4 explosives in October 2006 – over a decade ago…and as I wrote in September 2015 ALTANTUYA CHANGED EVERYTHING. Yes Altantuya changed everything because we had names, places, dates, time, murder weapon, records of everything that matters, and the murderers. For once, the powers that be could not hide, could not spin, could not eliminate any embarrassing and incriminating links from the lowly corporal to the numero uno in Seri Perdana. It was all there presented in courts .. the motives, the phone call records, sms records. That is why Altantuya changed everything. You all are familiar with the events leading up to Altantuya’s murder. Familiar with the very act and circumstance of her murder and what transpired before, during and after her murder. And we are all familiar with what happened after the guilty verdict. Let me now take you to today. This morning the above article was posted in the Australian – Australia’s equivalent to the Straits Times – but unlike the Straits Time, the Australian is respected, correct and proper in its role as a main stream media that tells truth. Available nationally (in each state and territory), The Australian is the biggest-selling national newspaper in the country, with a circulation of 116,655 on weekdays and 254,891 on weekends. It tells us about a letter that Sirul received from the Australian Immigration Department that informs him that his application for a “Protection Visa” will be denied and in that letter mentioned by the The Australian, Sirul is asked to have his say about the decision by the Australian Government to NOT grant him the protection visa. What does NOT granting him a protection visa means to Sirul? Simply said…he stays in detention for as long as he is in Australia. 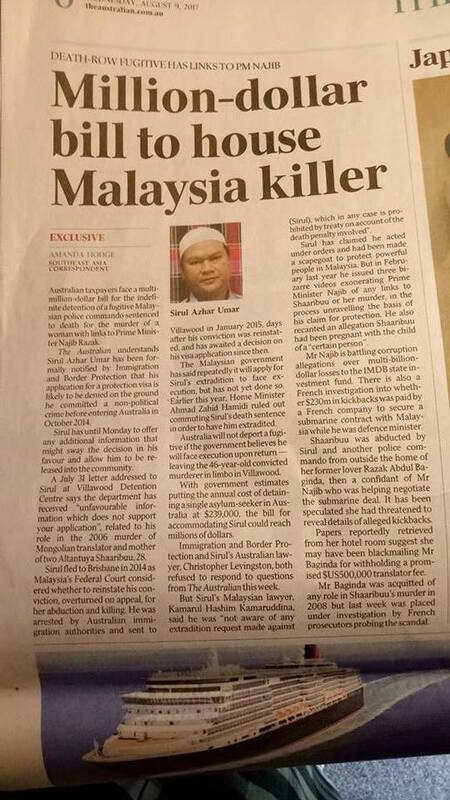 The Australian government will NOT sent him back to Malaysia because he has a death sentence hanging over his head. They will keep him in Australia…but behind bars. He will not be released into the community. The Australians have a way of describing the predicament Sirul is now in…they will tell him he is “fucked!”. If he still wants a protection visa that will allow him to live, work and play in Australia, what must he now do? He…or his lawyers, will have to find out who provided the “unfavourable information that does not support your application” as mentioned in the letter from the Australian government to Sirul. I would suggest that PM Najib would be a good place to start. Did Najib provide the unfavourable information that does not support Sirul’s application for a protection visa? And then there is that fornicating conduit through whom our billions were used to buy those Submarines from the French (with a hefty commission going his way! )….Razak Baginda. What information would Najib and Razak Baginda have that would be unfavourable and NOT support Sirul’s application for a protection visa? In layman’s terms….what can they say to the Australian authorities that will keep Sirul isolated and incarcerated in Australia for ever and ever? Whose interest is served if Sirul is immobilised and kept in detention indefinitely? Would it not be easier to manage/manipulate a powerless prisoner than a man out in the Australian community? A man who committed a “motiveless crime?” Your guess is as good as mine. I will not go into the process of what can and should be done by Sirul if he wants to live work and play in Australia…but this much I can say. There is a process he can and should go through within days of getting that letter from the Australian Government so that he can have that decision to not grant him a protection visa be appealed against and hopefully overturned. Sirul is a one of UTK’s foot soldiers…..not too bright in the head but can be depended upon to do as instructed by his superiors – the murder of Altantuya can attest to this “unique” trait….but has he got the ability to understand his current situation…his current predicament? Allah hualam! God only knows! And of course…he needs lawyers. Good human rights lawyers who can plead his case sans instruction from K Hell, from Umno and from Najib a JIb Jib. My sources tells me that Sirul has got three set of lawyers – one in K Hell and two set of lawyers in Sydney. Lawyers, whether in K Hell or Sydney are expensive…wonder where this corporal gets the money to keep three set of lawyers on stand by….and more relevant to his future, do these lawyers take instruction form Sirul or their paymasters? Kalau Sirul bayar …then he is the paymaster lah….kalau K Hell bayar…camna? For now, it looks like the Ghost of Altantuya has come to roost and Surul Azhar Umar is toast. This story is unfolding as I write. There will be more to follow. Amen! By Hussein Abdul Hamid|2018-07-14T05:56:54+08:00August 9th, 2017|Categories: Uncategorized|Tags: protection visa, Sirul|Comments Off on ALTANTUYA CHANGED EVERYTHING.